Lastnight my mom and I went to see "Easy Virtue" at the Amherst Theater. A lot of the movie was annoying but it was worth it for this one scene, when Colin Firth dances the tango with the lead actress. I have forgotten the name of the lead actress because 90 percent of the stuff that is not Leonard Pennario-related flies right out of my head. There is that moment when Colin Firth stretches out his hand to do the tango with this actress. That is what I whispered to my mom. That is a picture above of Colin Firth doing the tango. It is one of those movie things, everyone in movies knows how to do the tango. In real life no one knows how but in movies everyone does. Here is a tango I love. 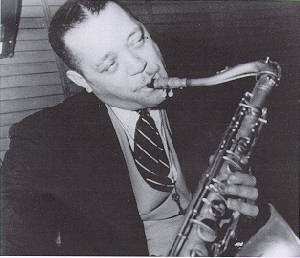 It is Lester Young! With Oscar Peterson. Pennario was an Oscar Peterson fan. As is every thinking human being. That sleepy saxophone of Lester Young. I love that. I have not heard this record in years. There is this funny moment between takes on this recording. The producer says: "Do it the way you did before. With the funky introduction." "But there's ladies out there," Lester Young says. "You said a funky introduction but there's ladies out there." Then there's the "Drop your drawers, drop your drawers, drop your drawers, take 'em off, take 'em off, take 'em off." I know every word in this song and every solo by heart. It is kind of off color but that is the charm of it, Lester Young just sang it so sweetly. Yesterday I was on the phone with Pennario's producer for Angel/EMI for TWO AND A HALF HOURS. This woman is brilliant and I loved talking to her and I am going to talk to her again. I would still be on the phone with her except I had to go to the movies with my mom and it got down to the wire. It hurt to hang up. I was just enjoying the conversation so much! She told me one sort of off-color story Pennario had told her about this woman who had shaken his hand after a concert. Well, it was hardly off color. It was very mild. But I was thinking, I am not surprised he never told that story to me. Pennario was chivalrous in a silver-screen sort of way and he would not tell me off-color stuff. He would not tell me this one Army joke either. He got to the point where it would have fit in to whatever story he was telling me and then just looked at me and said he could not tell me this joke. Nowadays most people do not care what they say in front of you, that is for sure. You just pass people on the street and they are dropping that F bomb! That happens to me all the time. All I have to do is get near someone and the person immediately gets on his cell phone and starts dropping that F bomb. So we beat on, boats against the current, borne back ceaselessly into the past. To Lester Young singing his sweetly naughty little tango. To getting to wear a long slinky gown and doing he tango with Colin Firth. Colin Firth stretching out his hand to you. "Colin Firth stretching out his hand to you. You guys on the telephone remind me of my ex-wife. The main difference is that she *would* still be on the phone! It is great to see this progress on the book. I cannot wait to find out more about LP's love life!